Approximately one year ago, I received an inquiry from an elderly woman in the Phoenix suburb of Surprise, Arizona. She witnessed 2 humanoid beings standing outside her bedroom window a few days before Christmas 2015. Her report included most of the information from the incident...though there were a few personal notes that I had redacted. 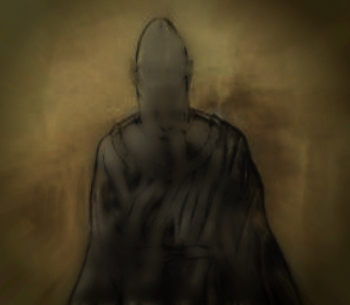 I presented this case to the readers and other investigators as a means of gathering additional data and knowledge about these beings. The witness was extremely alarmed by the incident and desperately sought answers. The emotional dialogue I receive. I think this relates to 3 portals - One of the portals is damaged - A building with a broken window or entrance. One of the Identities is hurt or/and missing. There is a deep sense of separation about this situation. There is a deep sense of abandonment. There is a deep sense of disconnection. A search is in progress – they are searching for something, and they are being searched for. Outcasts and Refugees – Workers - slaves unsure of what to do in their situation. They have a sense of self. They are related but not the same. They have a sense of what being afraid is - maybe it’s more a sense of being unsure – this is not a familiar feeling they are experiencing. A power challenge and a change in their previous environmental civilizational structure – new rules – aggressive searching – new duties to perform without instruction. Out of their natural environment - New lands and new opportunities. They are pioneers - they are trying to leave. They are having trouble adjusting to a new place. There is a very important aspect here – the ‘Very Important Purpose’ that they are supposed to looking for is not what they are doing when the lady saw them. I will explain the VIP in a diagram (below) – this is new ground. They are in a ‘predicament’ which I think has been outlined above – they are lost/unsure and are looking for food – but I think food means medicine in this case. They are out of their realm – yet they persist because they are ‘programmed’(?) to proceed – but they do not know how to exactly – they think/know they are in the wrong location – but they investigate for their needs – orders. They are doing their part to play in this bigger agenda – but their part is important. There is more than one team trying to do the same thing. There is a race mentality here – both a ‘competition’ and a ‘species’ race. These Identities were not a danger. There is a very strong sense here that tells me of a code or a classification called ‘RED DNA’ or ‘ReDNA’ or ‘R.E.DNA’ – it is not known of. There seems to be some form of research going on with this REDNA/ReDNA/R.E.DNA but it is done in secret and maybe done in an underground scientific facility. It does not seem to be originally from this planet, but it is now (if that makes sense). It takes the form of a type of sequence similar to a chemical algorithm. I have drawn it for you – though I have no idea if what I saw is the actual sequence or if it is just a close impression of what it looks like scientifically – or maybe some genome map. Something about the 2 entities tells me that they have unwittingly given up this information (they know no better). The information is not important to them, nor do they know the relevance of it. I see a man (human) working on this ReDNA/Red DNA/R.E.DNA – dark hair, white coat though he looks as if he is from the era of the 50’s/60’s/70’s. This research may be from back then – but it is now very prevalent for some reason – I think it’s ‘discovery’ is trying to be manipulated for weaponry – but it has more to do with human body, and comes from it or is entwined within it. I Googled the words and there are some pages regarding genetics – though it is out of my realm, none specifically called it RED DNA or ReDNA or R.E.DNA. The pages I saw also showed some type of protein binders – some of the examples related to insulins and I wondered if the woman has a history of diabetes or blood sugar or is insulin intolerant (or something like that). The picture of the sequence was very clear and I have drawn it for you. It is attached below. I also see a corporate building – top floor – lots of glass windows – windy outside – afternoon – a young man is in the open-plan office looking at a computer screen constantly checking it for updates – he seems agitated and impatient. He is in daytime, what he is looking at and checking on (on) the screen is in night time. He is wearing a white shirt, pants, a nice belt. He reminds me of the scientist from the 50’s/60’s/70’s that was mentioned above. I’m not sure if this young man is related to the scientist or is actually the same person (time manipulation) they look very similar. There are others in the office working, both men and women. It is a large corporation but only has 11 workers in it – they are human. This is what I saw – in these colours I have drawn it in. The other thing was this sequence was overlayed on the top of a piece of granite or polished grey rock – like a casket top. NDE - OBE: There was something that happened that night to the woman/person beyond just seeing the Identities. I am not sure the person believes that they saw this – like it’s not real? Metabolic imbalances and high rates of pulses. I am grateful to Deleece for conducting this session. She was not provided with any background information, other than what was included in the original post. This is why I was not involved with the RV session. Much of her interpretation on the witness was spot on. I also suspected a possible OBE. If you remember the 'David Eckhart' case, he described various humanoids / alien entities (including humans) being used as slave labor in massive underground caverns located on Earth. As well, many of these humans were used in experimental capacities, as observed by David at another facility he was taken to by his non-human (Reptilian) handler during an abduction. Is it possible that these particular humanoids were escaped 'slaves' who accessed a 'portal,' and eventually made their way to the surface? The scientific human interaction may also be a link to D.U.M.B. laboratories and/or joint (alien & human) facilities theorized to exist throughout the world. I had previously reported on an investigation at the Liverpool College of Technical and Further Education (TAFE) Liverpool, NSW, Australia, conducted on Saturday February 13th February 2016 by Deleece and APPI – Australian Paranormal Phenomenon Investigators. 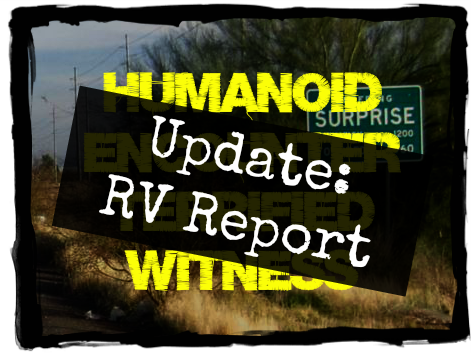 *Update: A well-known RVer told me today, after I forwarded the link to this post: "I am no longer surprised when people say they have seen phantoms/ETs - I would be surprised if nobody saw them. There is so much more going on with ETs visiting/living here alongside us, both our dimension and interdimensionally." CRV - Controlled Remote Viewing: Collected manuals & information to help you learn this intuitive art.